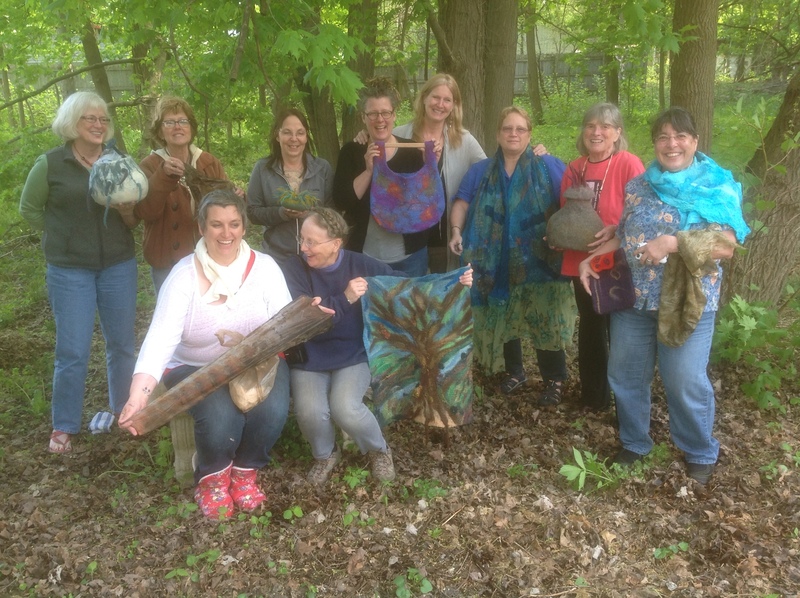 I'm so thrilled with the beautiful felt each participant made during our two days felting in Michigan, Dawn sure can put a fun and fabulous group of felters together!!! Tonight we're just going to unwind and tomorrow I promise to check emails and post all the pictures from day two. I'll leave you tonight with a group picture, thanks SO MUCH Dawn for organising the workshop and THANKS SO MUCH to everyone for being such good students and good sports! This entry was posted in America 2013, Felt, felt workshops and tagged Felt, felting classes, felting worksho by Nicola. Bookmark the permalink. Thank you Nicola for your generous teaching…I loved all of the felt works created. by the participants. We had such a great group..
What a Happy Workshop you all must of had, with those big smiles. Your Art looks so fab!